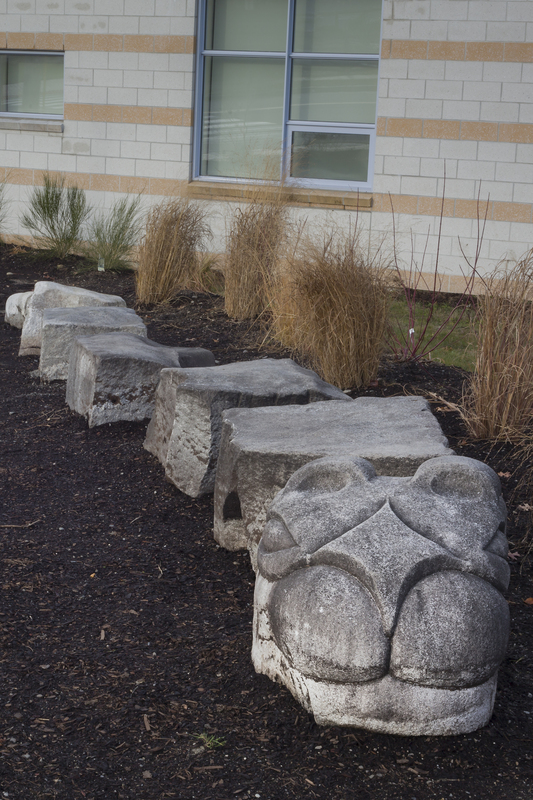 The Stone Dragon, a sculpture by Maine artist Carole Hanson, sited outside the East End Community School, was originally called The Serpent. The sculpture was commissioned by Maine Arts Inc. in 1996 for Congress Square Park, as part of a new plaza created for music and other events held there. 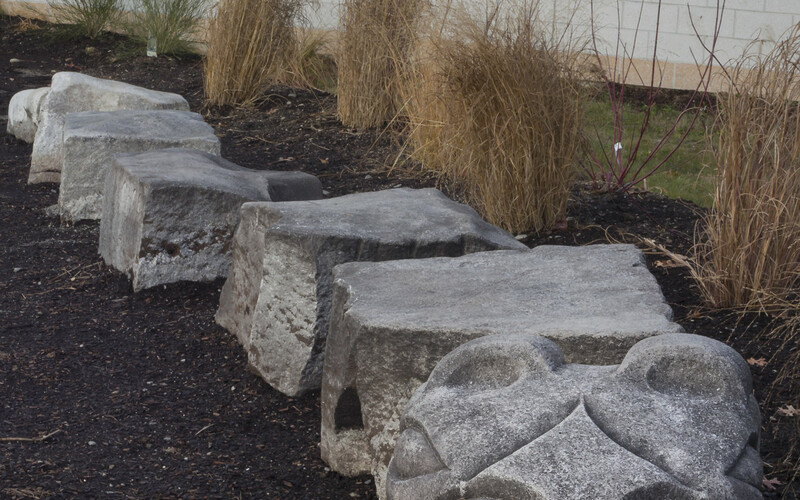 It was designed to line the walkway from the hotel’s entrance to the back of the park, and it served a dual purpose as art and seating–an arrangement of seven squared boulders spaced to suggest a sort of sea serpent, with head and tail stones carved in detail while the rest was left to the imagination. Originally conceived as a temporary installation, The Serpent remained in place until 2008. Nancy Davidson, who had a gallery fronting the park, spearheaded the fund-raising effort for the original piece. One of her clients, Tim Nason, made the first donation, followed by the Friends of Kay Hartt. School children, music lovers, tourists, and the resident bums enjoyed it. It was never defaced and seemed to be a point of pride to users of the park. 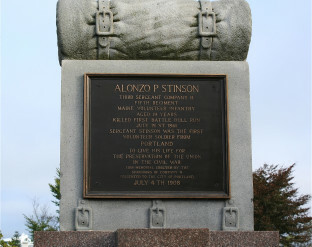 In 2008, the City of Portland transferred ownership of the sculpture to the East End Community School. 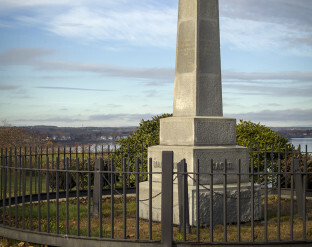 The piece was moved in October of that year to its new site on the Eastern Promenade. Portland Trails was instrumental in the installation. 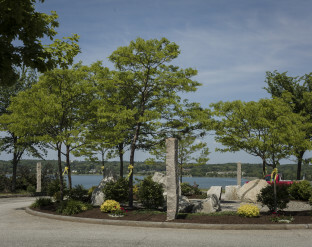 Landscape Architect Sashie Misner designed plantings for the setting. Additional stones, making the total ten, were carved in 2013 to transform Serpent to Dragon. A “wing-stone” and front-and-hind-quarters of the “body” were added. Why a dragon? Dragons are popular, children love dragons, and Hanson got behind the spirit of the changes, with the feeling that it would expand the sculpture. She contributed much of the carving time toward this transformation. The City provided $5,000 in community art funds in 2012, matched by the school and community. The Serpent became The Stone Dragon in 2013.